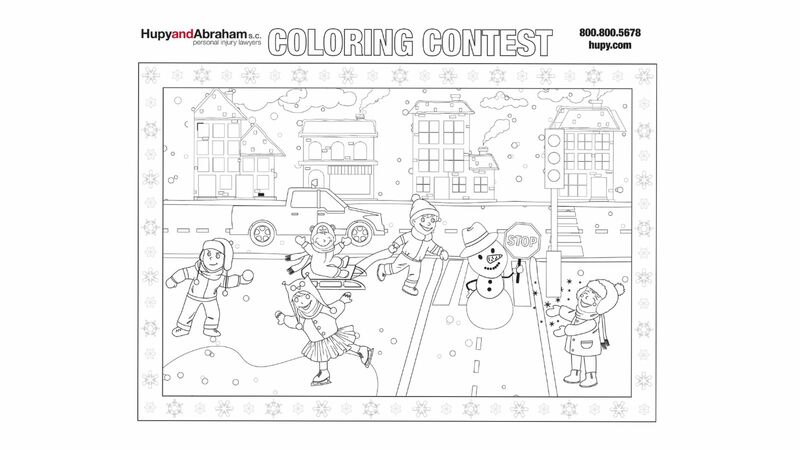 Hupy and Abraham, S.C. Winter Coloring Contest | Hupy and Abraham, S.C.
Hupy and Abraham, S.C. is hosting a “Color with Caution” coloring contest, open to children ages 3 to 12 in Wisconsin, Illinois and Iowa. Part of the firm’s mission is to give back to the community and to promote safety initiatives, so this contest was created for children to learn how to be safe and still have fun! We are inviting all parents, teachers and authority figures of children in the area to encourage participation in this contest. To ENTER: Color the image and indicate what age group (3-5, 6-8, 9-12) where the entry should be placed. As safety is the main goal of this contest, one entry in each age group will be randomly drawn and each winner will receive a gift certificate for $25. Each entrant will receive a coloring book just for participating. Entries can be submitted by mail to 111 E. Kilbourn Ave., Suite 1100, Milwaukee, WI 53202, or scanned to [email protected]. All entries must be postmarked by February 28, 2017. All entries will be posted to a gallery for viewing on Hupy and Abraham’s Facebook Page.